Selene is an audio/video converter for converting files to OGG/OGV/MKV/MP4/WEBM/OPUS/AAC/FLAC/MP3/WAV formats. 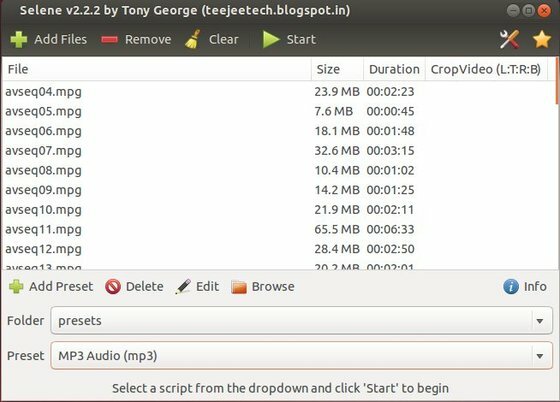 It aims to provide a simple GUI for converting files to popular formats along with powerful command-line options for automated/unattended encoding. The converting process is quite easy, just select a batch of audio / video files, set the output format and click start. The converter is available in PPA for Ubuntu 14.04 Trusty, Ubuntu 13.10 Saucy, Ubuntu 13.04 Raring, Ubuntu 12.10 Quantal, Linux Mint and their derivatives. Once installed, start it from Menu or Unity Dash. Hi, I have Ubuntu 12.04 . I cannot install because it says “missing opus-tools” and I cannot install it. How could I solve? opus-tools is available in Ubuntu 12.10 and higher. Go to the launchpad page, download & install the quantal version or install opus-tools from the third-party ppa (Click the “Other versions of ‘opus-tools’ in untrusted archives” to view PPAs).